I am starting this fund raiser for the 3 year old daughter of my friend , Mr.Suresh Nair. His 3 year old daughter, Aadya was diagnosed with B-cell Acute Lymphoblastic leukaemia (type of blood cancer) in March 2016. The child was undergoing treatment for the same. Unfortunately, the cancer has relapsed and the doctor's have advised cemotherapy followed by bone marrow transplant. The transplant has to be carried out urgently.The approximate treatment cost is about Rs.25 lakhs. The child's father is the sole bread winner for the family and has already spent in excess of Rs.15 lakhs over the last year for the treatment. 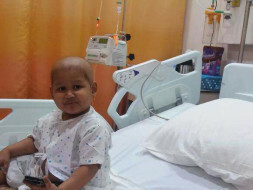 The cost of bone marrow transplant and further treatment is beyond his means. Any help; big or small will be welcome to save the life of an innocent child. The funds raised will be utilised for chemotherapy, bone marrow stem cell manipulation and infusion and supportive care/blood transfusion. 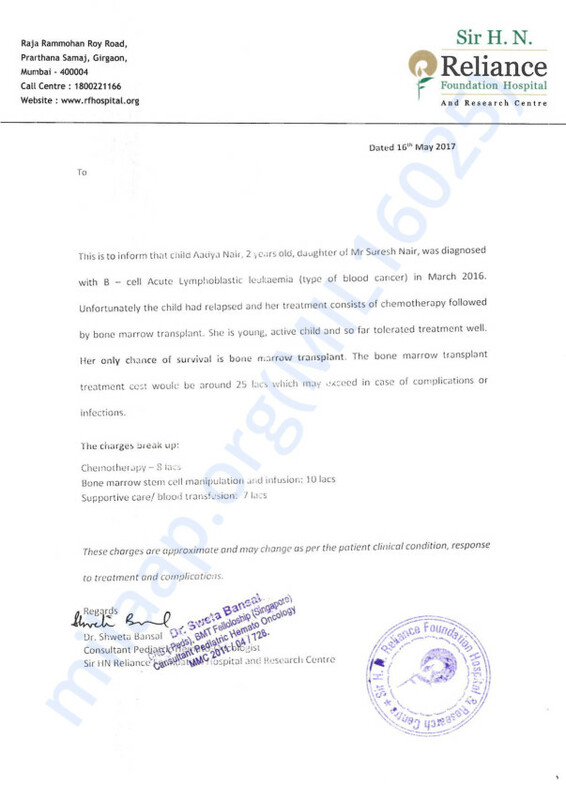 The letter from the hospital stating the approximate amount of treatment and the letter from the hospital providing the bank account details in which the donations can be credited are also being uploaded. Considering the paucity of time, urgent help on humanatarian grounds will be highly appreciated. May Allah give you shafa and cure all illness. Amen.